Speedy the cheeky house bunny: Tis Time to Announce The winner of Me Pirate Party Best Dressed Pirate! Tis Time to Announce The winner of Me Pirate Party Best Dressed Pirate! Ahoy Mateys Tis Time to Announce the Winner of Thee Best Dressed Pirate from Me Party! She got an Amazing amount of vote's so Lest 'ear it for Thee Star of Thee Ocean Captain Sushi! It sure was a fun Pawty Speedy....luvved efurry minutt of it!! You are indeed a fierce and fighting pirate. It is easy to see that you deserve to win. We lost to a Japanese pirate???? Meow!!! This made Mom laugh like crazy! I wonder why? I'm no Japanese, but I was a pirate. CONGA RATZ TWO EWE CAPN SUSHI ~~~~~ !!! 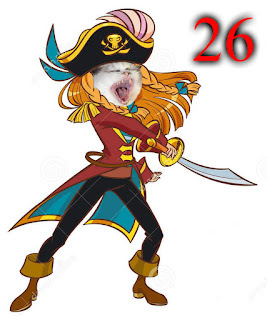 Way to go Sushi, you're rockin' the pirate gig! I'm so happy, Speedy! I may not be online blogging much, but when I do, I got Mom's full support. Speedy, Mom said that winning 3 times in a row is more than enough. I should be grateful for that already. 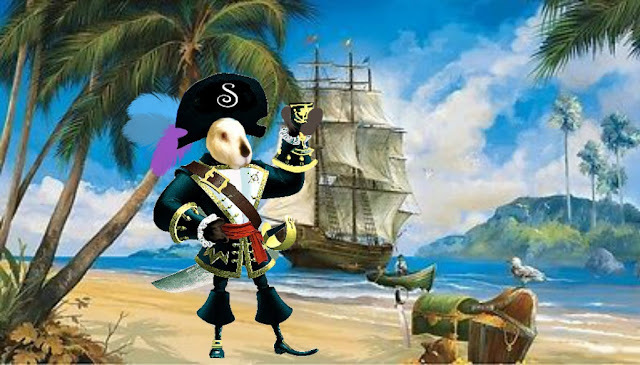 Mom said that this will be my last Pirate entry. I will still be here though cheering for my furiends next year. Maybe I will join a different contest. Who knows. Wow! Captain Sushi is amazing! Congrats to her! Well - if it had to be a cat, best be Sushi!!! Captain Sushi LOOKS LIKE A SCARY PIRATE, and therefore, is a great winner!!!!! !